What did the Caribbean islands – acoustically- look like before the arrival of Columbus? With this question in mind I took a short trip to the National Park of Guadeloupe and to Dominica, one of the most preserved island of the Lesser Antilles, which still retains some of its primary forest on the slopes of its volcanic peaks. I crossed the paths of the ‘Jaco’ and ‘Sisserou’ (the endemic species of parrots), met some local insects and tree frogs, but unfortunately failed to find any ‘Mountain Chicken’. 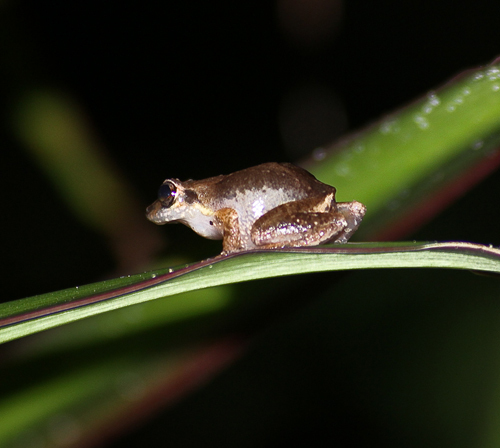 This endemic giant frog – Leptodactylus fallax – has now virtually disappeared from the island due to chytridiomycosis*. 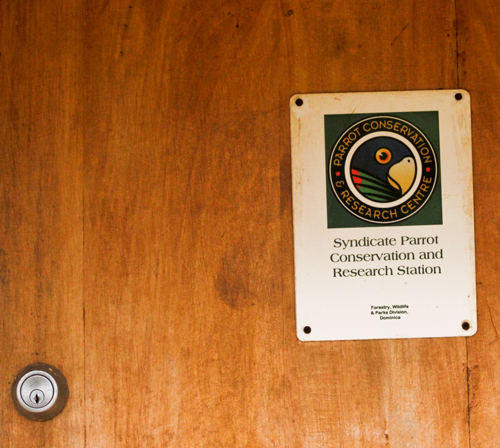 These recordings were made in January 2013 near the Grand-Etang, Guadeloupe (track 1 &4), and Morne Diablotins National Park, ‘Syndicate Reserve, Grand Bay, Dominica. *Chytridiomycosis is an infectious disease caused by a fungus and responsible for the global and critical decline of amphibians worldwide. 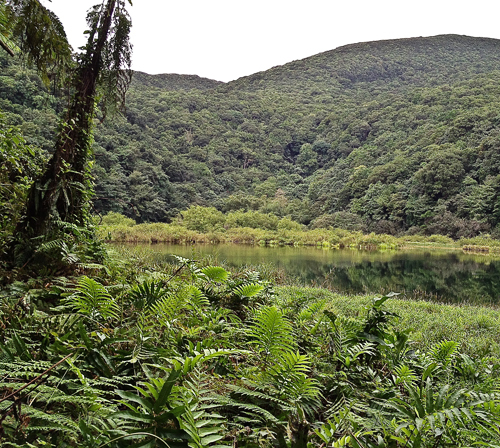 01 – Le Grand-Etang, Guadeloupe National Park. 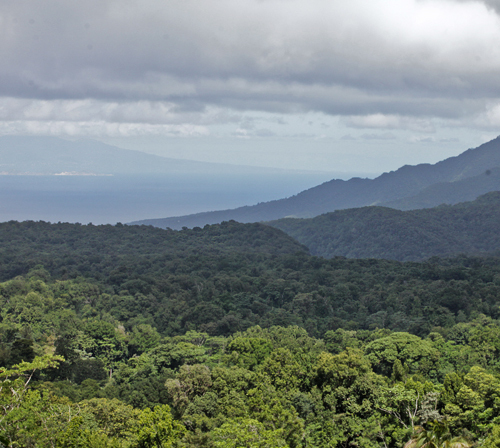 02 – View of Guadeloupe from the Morne Diablotins National Park. 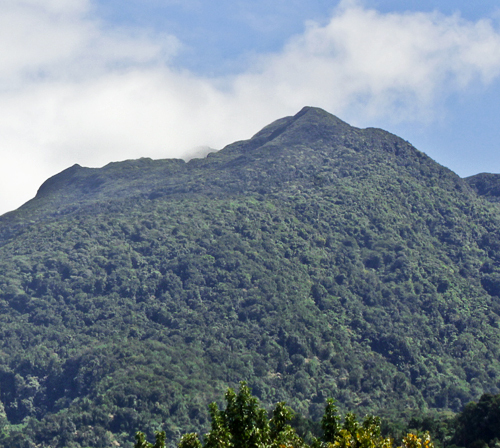 03 – the Morne Diablotins (largest volcano on Dominica – 1447m). 04 – Primary forest on the slope of Morne Trois Pitons. 05 – Secondary Forest with Citrus fields (near Syndicate reserve). 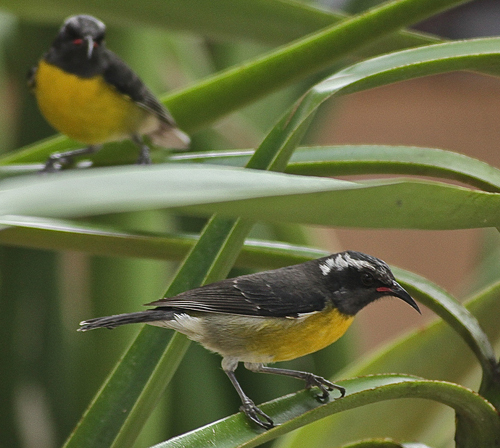 06 – Bananaquit or sugarbird (Coereba flaveola) – Maybe the most common and noisy bird in the islands. 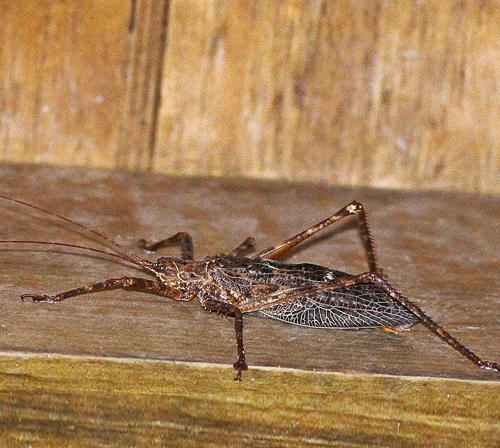 07 – Lesser Antilles brown Katydid (identified as Xerophyllopteryx fumosa), Syndicate reserve. 08 – Lesser Antilles tree frog (Eleutherodactylus martinicensis). 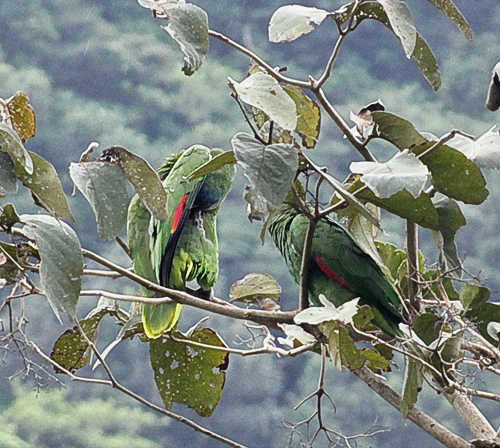 09 – Pair of Red-necked Amazon (Amazona arausiaca) under the rain, endemic. 10 – Lesser Antilles hummingbird, Purple throated Carib (Eulampis jugularis). 11 – the Studio at Syndicate Reserve. 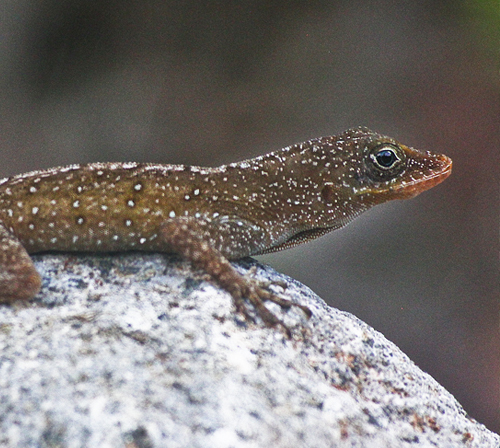 12 – Dominican Anole – Atlantic ecotype (Anolis oculatus winstoni), endemic. The CD release takes in eight tracks in all, and these last between just over the minute mark, to just shy of the twenty nine minute mark. These tracks take in untreated recordings made by Mr Alexis in early 2013, at various sites in the national parks of Dominica and Guadaloupe. And these purely natural recordings attempt to take us back in time to the year 1493, when Colombus first discovered both islands. I found the album started off been sonically pleasing, though more than a little underwhelming- you see it opens up with three tracks that each last between two & five mintues piece, and each these of just focus in on sonically attractive if not very engaging or rewarding parrot & exotic bird song ‘n’ chatter. From track four onwards I found things became a bit more interesting & appealing- track four “Grand Etang at Dusk” finds Alexis taking us on a just under nineteen minute trip into the rich & detailed sonic world of Guadeloupe at dusk, with a rewarding sound map made up of thrush twitter, thrasher chirp, & tree fog chatter. With the highlight here been the just under twenty nine mintues of “A Night in Grand Bay”- which captures the night time sounds of Guadeloupe, with it’s detailed & slowly shifting sound scape taking in: layered mix of harmonic bird song & constant grasshopper buzz. Through to close-up, then distancing sound of rushing waterfall & bird song textures. Onto rain down pours & rich/ layered birdsong structures, back to sududed & thinning out mixture of bird & insect sound. As always with Gruenrekorder releases, sound wise the recordings here are crystal clear & wonderfully captured. 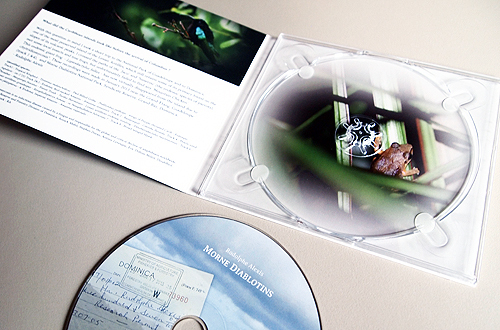 Also the release comes in a rather hansom colour digipak, which takes in pictures of birds, parrots and frogs from the islands of Dominica and Guadaloupe. Weiter geht’s auf der Reise, jetzt in die Karibik. „Morne Diablotins“ Rodolphe Alexis versucht die Wiederentdeckung eines Landstriches. „Wie sahen die karibischen Inseln aus, bevor Kolumbus kam?“ fragte sich Alexis – bzw. wie hörten sie sich an? Er reiste in den Nationalpark von Guadeloupe und auf die Kleinen Antillen, wo es auf den Bergen noch Reste des Urwaldes zu bestaunen gibt. Insekten, Frösche, das Erwachen der Vögel bei Sonnenaufgang, das Rauschen des Regens auf dicken Blättern, all das kann man hier wunderbar nachhören. Der Morne Diablotins ist die höchste Erhebung der Insel Dominica und eine schöne Fundgrube für Geräusche, die es so vielleicht nicht mehr lange zu hören geben wird. 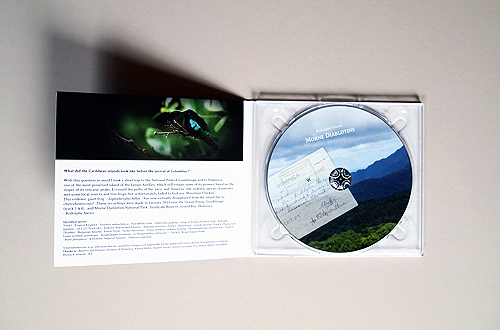 ‚Sempervirent‘ (2012) of Rodolphe Alexis was reviewed on loop and consist ina research in Costa Rica doing multichannel field recordings in different ecosystems of Central America. Rodolphe Alexis is a French field recordist artist and designer who lives and works in Paris. His work is based on field recording, electroacoustic composition, radio parts and specific sites for installations or performances. What did the Caribbean islands – acoustically- look like before the arrival of Columbus? Rodolphe Alexis with this question in mind he did a sound research in the National Park of Guadeloupe and Dominica (Caribbean Sea) and one of the best preserved islands of the Lesser Antilles. 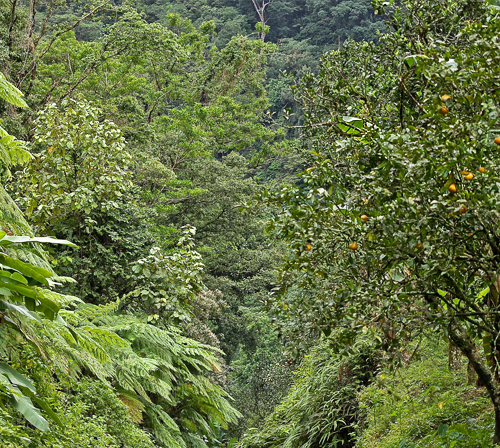 These recordings were made in January 2013 near Grand-Etang, Guadalupe (tracks 1 to 4) and Morne Diablotins National Park, a Nature Reserve in Grand Bay, Dominica. On ‚Morne Diablotins‘ sounds of the wildlife of these unexplored places are captured: insects, different types of birds and frogs, parrots, roosters, Lesser Antilles grasshoppers, etc. The listening experience is a possibility of being immersed in the rich wildlife diversity of these places. ‘Morne Diablotins’ begins with a question: What did the Caribbean islands look like – acoustically- before the arrival of Colombus? Following in the footsteps of the famed Italian explorer, field recordist Rodolphe Alexis journeyed to the Lesser Antilles in search of answers. The islands of Dominica and Guadaloupe, both encountered and described during the second voyage of Chrisopher Colombus, provided Alexis with ample inspiration. Eight recordings from the expedition made the final cut, each one a perfect sonic postcard of exoticism for our western ears. A variety of birds, amphibians and insects lend themselves to the soundscapes, some of which bring with them more than just a pleasant listening experience. Track 8 includes the calls of the endangered Imperial Parrot, while track 2 focuses on the vulnerable Jaco Parrot. Both are endemic to Dominica and can be found nowhere else in the world; as recordings of these species are rarely found in archives, the publication has scientific value as well as the obvious aesthetic appeal. As one would expect from Alexis, and indeed Gruenrekorder, all eight recordings are of exceptional quality. 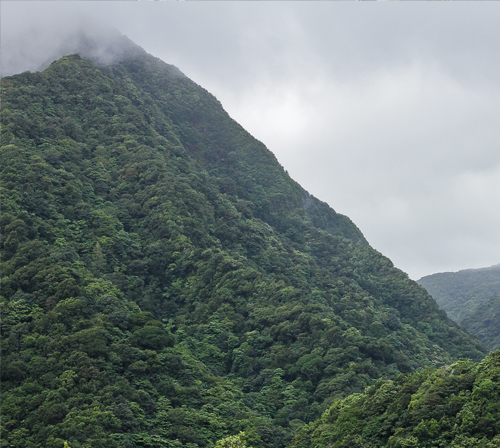 A personal favourite is ‘A Night in Grand Bay’, a 28 minute snapshot of Dominica’s Morne Diablotins National Park. It is exquisite; a delicate blend of insect and amphibian voices, complimented by rainfall that gradually diminishes as the close of the recording approaches. Perfectly balanced, perfectly judged and something that I could happily listen to again and again. Another recording that I think deserves special attention is ‘Grand Etang at Dusk’. Coming in at just over 18 minutes, we are treated once again to a long, uninterrupted soundscape, this time recorded on Guadeloupe rather than Dominica. I find myself leaning more and more towards these longer field recordings which, when well done, give the listener plenty of time to ease themselves into the sound and all the nuances that come with recordings of this nature. 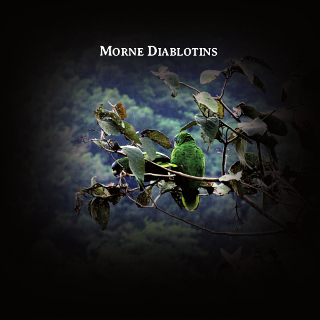 ‘Morne Diablotins’ is a worthy addition to Rodolphe Alexis’ growing discography. The recordings have an eternal quality that, though contemporary creations, speak of a time before colonisation. Together they offer a window into the past and an opportunity to appreciate the natural wonders of these island nations. Wyobraźcie sobie jakie dźwięki moglibyśmy usłyszeć w lasach Wysp Karaibskich, gdyby Kolumba pożarły morskie stwory i nigdy tam nie trafił. Francuski artysta Radolphe Alexis wybrał się do Parku Narodowego Gwadelupy i Dominiki zadając sobie podstawowe pytanie. Jak mogły wyglądać Wyspy Karaibskie – w kwestii dźwięków przyrody – przed przybyciem Krzysztofa Kolumba? Dominika to jedna z najlepiej zachowanych wysp w archipelagu Małych Antyli, a na niej znajdziemy spore połacie pierwotnych lasów, które porastają stoki wulkanicznych szczytów. Alexis zabiera słuchaczy na szlak wijący się gdzież u podnóża tytułowego wulkanu „Morne Diablotins” na Dominice. W pierwszej kolejności poznajemy uroczy śpiew papug tzw. amazońskiego perkoza („Jaco”) i amazonki cesarskiej („Sisserou”). Obie papugi traktuje się w kategorii endemicznych gatunków. Dźwiękowa przechadzka z Alexisem wśród lasów staje się tak autentycznym przeżyciem, że czuć jak pulsuje gorące powietrze, a wraz z nim niezliczone ilości różnych owadów i żab. Autor wyznaje, że nie udało mu się trafić na wyjątkowy okaz żaby jaką jest „Mountain Chicken” (tak jest nazywana w miejscowym slangu – tutaj filmik). Endemiczny gatunek tej olbrzymiej żaby jest praktycznie na wymarciu. Taki stan rzeczy wywołała choroba zakaźna spowodowana przez grzyby (chytridiomycosis), które niszczą też wiele innych płazów na całym świecie. Jedno z fascynujących i doskonale wyważonych nagrań na tym krążku to „A Night in Grand Bay”, dzięki niemu możemy spędzić sporą część nocy w rezerwacie Grand Bay. Z kolei fragment „Grand Etang at Dusk” przenosi nas na Gwadelupę – a tam szept, śpiew ptaków, cykanie i szmer. Prawie dwadzieścia minut tego nagrania sprawia, że odbieram to miejsce nie tylko jako „hałas” jaki generuje przyroda, dla którego las pełni rolę pudła rezonującego, lecz postrzegam jako przestrzeń porażająca swoim spokojem. Na pewno albumu Radolphe’a Alexisa nie należy traktować jako egzotycznej pocztówki dźwiękowej przywiezionej dla Europejczyków. Przede wszystkim jest to materiał niezwykle ważny pod względem naukowym i estetycznym. Z tego co mi wiadomo, to bardzo ciężko jest spotkać w jakichkolwiek archiwach nagrania odgłosów wspominanych papug. „Morne Diablotins” to płyta będąca spojrzeniem w przeszłość pozwalająca wyobrazić sobie, jak mógłby brzmieć świat nieodarty z dziewiczej natury przez człowieka-kolonizatora. Okazuje się, że temat jest tak samo aktualny dziś, jak i kilka wieków temu. A documentation of avian, insectile and amphibious life in Guadeloupe and Dominica as well as surrounding, non-aniumal sounds. As with many similar releases I’ve encountered, it’s tough to make any sort of value judgment except to say how well or poorly the environment seems to have been captured, in this instance, very well. Choices of what to include seem based on which particular fauna have been caught on tape, lending a kind of „nature study“ feeling to the endeavor. Which is fine–clearly, you don’t need to listen to this as an art project, just vicariously troop along with Alexis as he roams the rain forests and volcanic peaks. On the one hand, you can understand his search for a Caribbean „before the arrival of Columbus“ but on the other, you wonder how far to take this avoidance of contemporary reality. There’s a decided risk of luxuriating in the exotic sounds and forgetting the world around. And I have to admit, the sounds are pretty impressive even though, necessarily, one would really like to be surrounded by them rather than listening through speakers. Picking a „favorite“ track seems strange, but „Grand Etang at dusk“ has a lot going for it, including a wonderful, if brief, shower. I get the impression that Alexis has done some post-recording layering, not sure. In any case, while it’s not the kind of thing I’d normally find myself going out of my way to listen to, I can’t quibble with the quality of the sound–it’s routinely dense and intriguing. 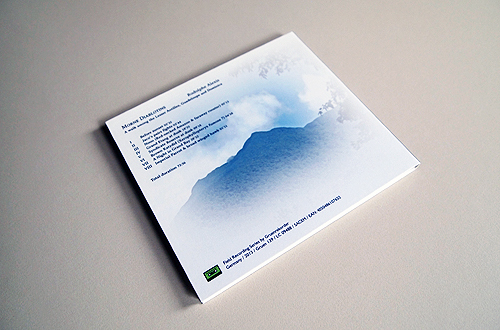 If you’re at all into pure, natural world field recordings, this is right up your alley.